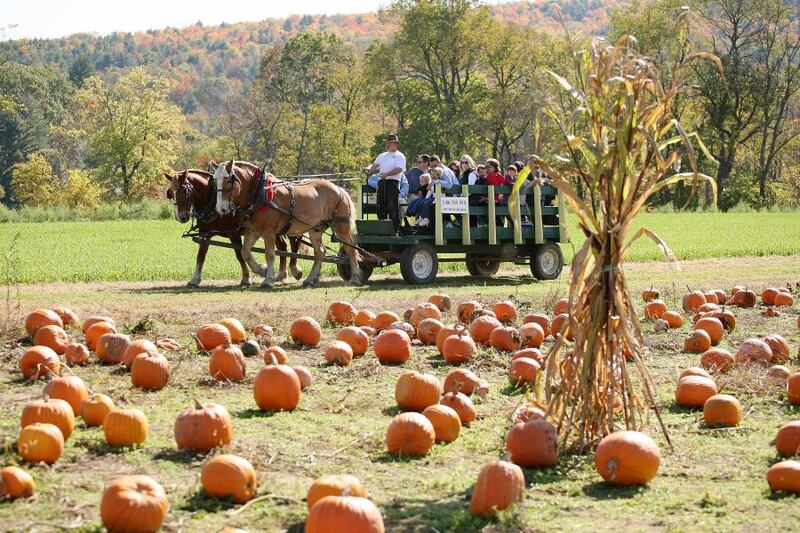 Fall certainly is a popular time for harvest festivals around Vermont and pumpkins take center stage at many of them, but not many with the same allure and proficiency that Cedar Circle Farm & Education Center in East Thetford seems to have mastered. Over the past 11 years of organizing and coordinating green harvest festivals on their 50-acre organic farm, Cedar Circle has figured out how to park, entertain and feed nearly 2000 people at its annual pumpkin festival while only generating 2.5 bags of trash! A FORMULA FOR SUCCESS Their dedicated staff, led by Education Coordinator Cat Buxton, and many loyal volunteers run a smooth, well-organized event that draws people of all ages who come to the farm by car, bicycle, and train from the Upper Valley and beyond to celebrate local organic agriculture and everything pumpkin. The festival could easily serve as a model event for the growing agritourism industry in Vermont. HORSE-DRAWN RIDES, ACTIVITIES & ENTERTAINMENT ALL DAY! 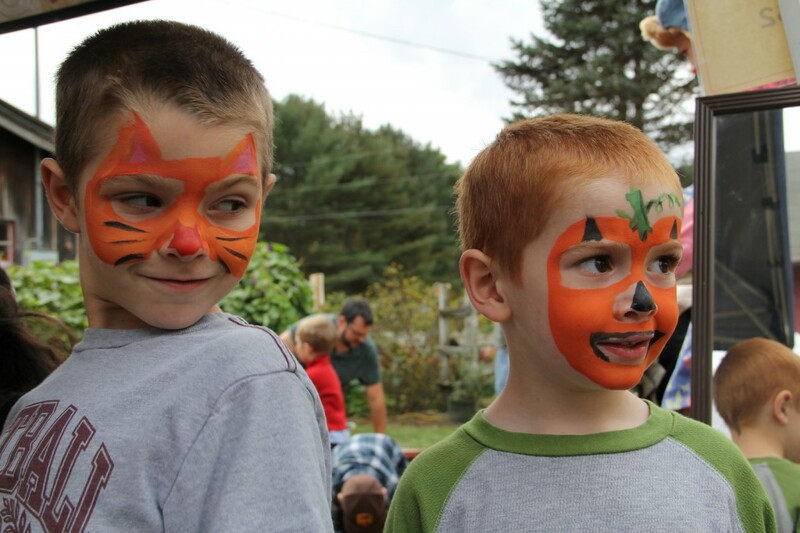 The fun and educational activities have made the pumpkin festival a favorite with many families who return year after year. Several teams of draft horses pull wagon loads of festival goers to and from the pumpkin patch and corn palace throughout the day. 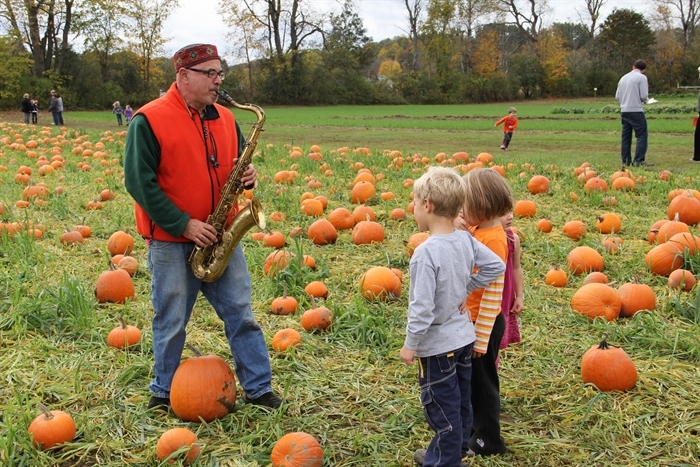 A saxophonist plays amongst the pumpkins while children scurry to find the perfect one for their Halloween jack-o-lantern. With that important task taken care of, they are “free” to engage in activities such as barn mural coloring, harvest wreath making, cider pressing, face painting and new this year juggling by Tony Duncan of Nimble Arts in Brattleboro, VT and story telling in the all-new Enchanted Forest with British storyteller Simon Brooks of New London, NH. ORGANIC “GOOD FOOD” CONCESSION This kind of excitement can stir up a healthy appetite for delicious farm-grown and farm-made organic goodies offered at the “Good Food” Concession. In addition to hearty soup and salads, grilled local sausages and veggie burgers, butternut apple crisp and pumpkin brownies, NOFA-VT once again brings their copper-domed mobile oven for wood-fired veggie pizzas and VT Crepe & Waffle serves savory and sweet treats from their cart. Offered under the main tent, live music is played throughout the day–this year by The Stovepipe Mountain Band, an Americana Possum Rock band based out of Corinth VT and the Crunchy Western Boys, an alt blues group from Warren, NH. WHEN, WHERE & HOW MUCH? WHEN is this wonderful festival you ask? Always the Sunday of Columbus Day Weekend, on OCTOBER 13th this year, from 10-3. And exactly WHERE is it? At Cedar Circle Farm & Education Center on Pavillion Road, off U.S. Route 5 in East Thetford, VT. Directions to the farm can be found on their website. And HOW MUCH does it cost? $10/per car which includes all of the activities and entertainment for as long as you’d like to stay. You can also come by bicycle or on foot or take the train out of White River Junction and get in free, but please leave your pets at home. You’re also encouraged to bring a place setting and cup to help reduce the amount of trash generated. Keeping down to 2.5 bags is no easy task at this green event. 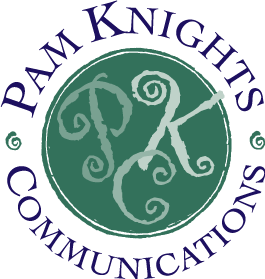 WHY DO I THINK THIS FESTIVAL IS SO SPECIAL And how do I “know” so much about this festival…I have had the pleasure of working with Cedar Circle Farm to promote their strawberry and pumpkin festivals from the get go and this is now their 11th annual! I also try to volunteer every year and never get tired of attending, its such a beautiful farm and there are so many happy faces and bright orange pumpkins– that its become a fall ritual that I look forward to year after year. Parking $10 per car, carpooling encouraged. Admission includes all entertainment and children’s activities including face painting. Free admission for walkers, bicyclists and train passengers. Leave pets at home please. 10-3: Free: Horse-drawn wagon rides to and from the pumpkin patch and corn palace, children’s crafts, cider pressing, self-guided tour and educational displays. Kids’ activities include face painting, hula hoops, educational games, color station, barn wall mural, and harvest wreath making.